Ένα πρώτο μέρος του έργου ISLAND HOPING παρουσιάζεται το Badisches Landesmuseum Schloss Karlsruhe, στα πλαίσια του Global Culture 2018. Στο Κέντρο Τεχνών, παρουσιάζεται το συνολικό έργο αυτή της σειράς με την υποστήριξη του NEON και τη συνεισφορά του Δήμου Φούρνων Κορσέων, του EuroMare και της Eleni Koroneou Gallery. The City of Athens Culture, Sports & Youth Organisation is pleased to present the first institutional solo exhibition of the Greek-German artist Christina Dimitriadis, organised at the City of Athens Arts Centre from 9 November 2018 to 3 February 2019. The exhibition, titled Island Hoping, presents the artist’s new photographic project. Island Hoping – an optimistic wordplay on the notion of island hopping – explores images and myths of the Mediterranean, a geographical entity, but above all an imagined reality, in which the appreciation of beauty and a collective spirit are deeply ingrained. The Mediterranean is sometimes described as a cultural space, but in fact its historical and political reality has always been more complex. 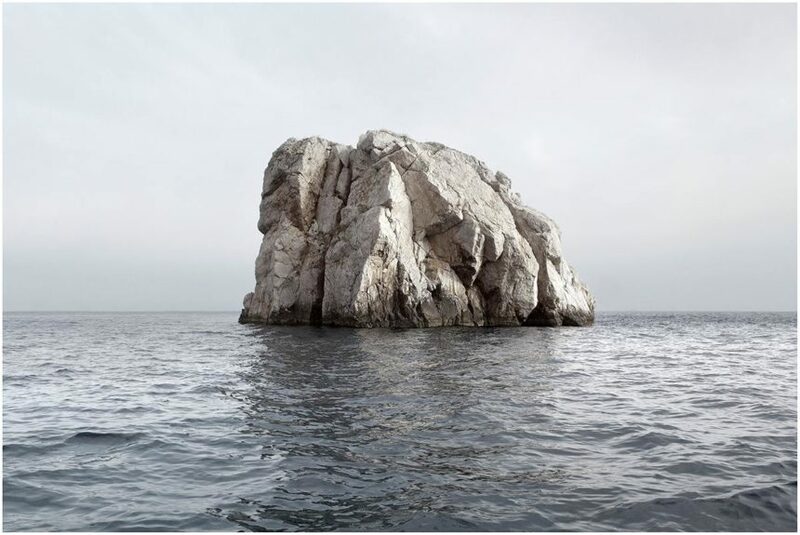 In these meticulously structured photographs, islands and rock formations emerge from the sea in an indeterminate landscape. Due to their morphology and ruggedness, the rocky shores of the Aegean islands evoke ambiguous emotions that lie between optimism, hope, and uncertainty. Christina Dimitriadis’s aesthetic approach transforms the landscape from hospitable to barren. The starting point for the series was a black-and-white photograph of Helgoland, an island in the North Sea with a distinctive political and geographical history. It is also the birthplace, on the maternal side, of the Dimitriadis family and the beginning of a continuous biography of migration. Past and future, individual and collective flow together, making Island Hoping a hybrid of North and South. The first segment of Island Hoping is on view until December 2018 at the State Museum of Baden Schloss Karlsruhe for the New Annual Studio Solo Exhibition under the auspices of Global Culture 2018. The complete series is now on display at the Athens Municipality Arts Centre, with the support of NEON and contributions from the Municipality of Fournoi Korseon, EuroMare, and Eleni Koroneou Gallery. These photos were taken on Fournoi Korseon, perhaps the largest archipelago, bounded by the islands of Ikaria, Patmos, and Samos – a location of great geological, geopolitical, and historical importance, sadly prominent in world news coverage on account of having the largest number of shipwrecks since ancient times and, tragically, being on the deadly path of migration today. Exhibition opening: Friday 9 November 2018, 8:00 p.m.